This is the second part of the text of a speech given by former city councillor Pat Rogan to a housing conference in the 1970s in which he recounts his battles to transform Edinburgh’s housing conditions. In the first part, he explained how he came to be elected a councillor; his shock and dismay at discovering the true extent of the squalor and distress of slum life; and the reasons for the proliferation of these slums in the centre of the city. In the following section, he tells of the struggles people faced to cope with the slum conditions; the lengths they went to in order to try and find a better home; and his dealings with Council officials – some sympathetic, some not. …But there was one loophole in the regulations, and it was exploited deliberately, but legally. At that time, if one was foolish ehough to find a room and kitchen, or a single room, no matter how cramped and uncomfortable, and without proper facilities, one was then considered to be housed, in the view of the Council, and then had to wait until the house collapsed or was chosen as being unfit for human habitation. On the other hand, if one was clever, and instead of house-hunting, took refuge with one’s parents, or found furnished accommodation, then one was regarded as “homeless”, and shot to the top of the queue, although the living conditions were much superior to those enjoyed by the slum dwellers. This anomaly I placed repeatedly before the Finance Committee, but it took a long time before they appreciated the unfairness of the letting system, and amended the regulations, to give those living in unfit houses a better share of the new homes being built. Private house-building was restricted because vital materials were earmarked for municipal work, the only exceptions being the conversion of large houses into flats, but here too I suspected valuable materials were diverted from local-authority schemes. But the whole situation was aggravated by a slow-moving house-building programme. The method of tendering for new housing didn’t help matters. At that time, tenders were accepted on an individual trades basis, with each contractor, or sub-contractor responsible for his own work, the overall control or supervision being left to the officers of the Town Council. This involved the Town in arithmetical checking of all these separate tenders before contracts could be awarded. But, worse, at the monthly progress review, we were told repeatedly that delays were caused by certain contractors, who, impeding the whole works, would blame lack of labour, shortage of materials, or lack of cooperation from other trades. I was instrumental in having this changed, so that one main contractor was appointed. He was held responsible for all sub-contract work, and would be answerable for delays or bad workmanship. This move proved worthwhile, but meant the removal of contractors who were not big enough to assume control. A list of subcontractors had to be submitted and approved, before the main contractor could employ them. At that time, the housing section of our Health Department was controlled by a man named James Robertson,who for many years had worked in that department, and had a tremendous knowledge of Edinburgh’s slums. Pre-war, he had supervised many slum-clearance schemes, but his efforts were now blunted until such time as the removal of unfit houses could be renewed. But he proved himself useful in other directions, especially when measuring houses where valuable points could be gained by the occupants for overcrowding. Where he felt the need was urgent, and a family should be rehoused as soon as possible, his measuring tape would shrink, and the dimensions he submitted would ensure the early removal of a suffering family. I called on his help regularly when severe cases of overcrowding were brought to my attention, and he responded magnificently. When discussing housing with him, he often spoke to me about one of his predecessors, a Mr Allan Ritchie, who defined a slum as “Darkness, Dampness and Dilapidation”. I have not heard a better description, unless one adds the word “Despair”. The slums of the ‘fifties and ‘sixties, which had been festering from pre-war days, were truly hideous, and, in addition to the general discomfort, the families who occupied them had to contend with infestations of vermin, as well as regular outbreaks of dysentery. A pamphlet was issued by our Health Department, advising slum-dwellers how to control dysentery by the use of disinfectants, which included wiping down the toilet cistern chain after use. One bewildered woman, whose brass chain had long since gone, asked me, “How do you disinfect a piece of string?” “Burn it!” I replied. Every Thursday night, I and my two ward colleagues held a surgery when around fifty people would turn up, the majority to plead for help in getting a house, or to ask us to find out the latest position of the house waiting list. It was always the womenfolk who turned up at these meetings. In many years as a councillor, I don’t think I met any more than a dozen men seeking help with a housing problem. The stories from these anxious wives and mothers were desperate and heart-rending, and the more often I heard their sad tales, my frustration and anger rose accordingly. As an example of their desperation, a young woman came to see me one evening, accompanied by a toddler, and obviously she was expecting another child. She explained that she lived in a single room on the top flat of a run-down tenement, and, because of the badly designed staircase, she had difficulty in moving her pram up and down the steps. But that day she had been in Tron Square (a small housing scheme off the High Street, built after the First World War), when she noticed a certain house with boarded windows. If I could arrange to have the windows repaired, she would undertake, free of charge, the cleaning of the house, before accepting the tenancy. Her offer – and she was aware of the circumstances – left me speechless, because the house in question had been the scene of a brutal double murder about a year previously. A man named Robertson had just been released from jail, and returned to the house in Tron Square, where he met his wife and two teenage children. Almost immediately he attacked, with a knife, his wife, and killed her. His young son, trying to escape through the window, was also killed, but fortunately his daughter, although injured, managed to escape. Robertson was tried at the High Court in Edinburgh and, on the 23rd of June, 1954, he was hanged at Saughton Prison. He was the last person in Edinburgh to be executed. I took the woman’s case to our house-letting chief. He too was astounded at her courage had the house repaired, cleaned and painted, and granted her the tenancy. Categories: history, people | Tags: Community Council, history, housing, politics, regeneration | Permalink. Last week’s Community Council meeting saw a presentation by housing developer Places For People and architects Cooper Cromar which outlined ideas and designs for the redevelopment of the vacant land at Harvesters Way. The meeting was well attended by members of the public demonstrating the keen interest there is within the local community about what is happening on this key site in the centre of Wester Hailes. Various options for the overall design of the scheme – including the layout of roads, location of car parking and potential bus routes – were put forward. Members of the Community Council were heartened to see that Places For People aim to make a vibrant public realm area, located between the Healthy Living Centre and the proposed housing, the lynch pin of their plans. The architect also drew attention to the importance of establishing good pedestrian and cycle routes to inter-connect with adjacent areas. Although the design process is still at a relatively early stage, Places for People indicated that the anticipated scale of the project will be between 150 and 170 homes and that these will be all or mostly flats. It is likely that social rented housing will comprise around 20% of this total with the remainder being made up of mid-market rent properties, housing for sale and shared ownership. The hope is that one or more small shops will be located within the housing block next to the public realm. The situation of this block will also allow a degree of passive surveillance over the area. The representatives from Places For People confirmed that a further presentation will be made to the Community Council when more detailed designs have been prepared. As part of this ongoing process, the Community Council will be formally responding to Places For People in the near future with comments and suggestions as to how the outline designs might be developed and improved. It’s great to see the developer and the Community Council working together closely like this and the input of local peoples’ knowledge and experience can only be good for the project and assist in ensuring its success and long-term sustainability. 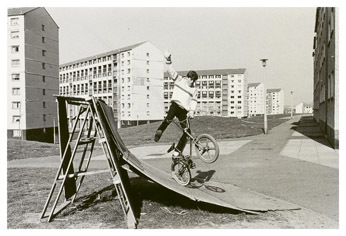 Harvesters Way was originally known as Wester Hailes Drive and the land which is to be redeveloped was then occupied by five huge multi-storey blocks (numbers 70, 71, 72 73 and 74) which cast grim shadows over the surrounding area. From the beginning there were dampness problems within many of the flats due to poor design and construction. Very soon after that, the fabric of the buildings began to deteriorate at an alarming rate and all five blocks were demolished in 1994 just over twenty years after being built. The site has since lain derelict despite various redevelopment proposals – including an ice rink, five-a-side football pitches and a leisure centre – being mooted over the years. Categories: history, people, photographs | Tags: architecture, community, Community Council, Design, Harvesters Way, news, people, photographs, regeneration | Permalink.